That must be ridiculous to write. That year's first april, I got to the Bibliothèque Municipale de Strasbourg, downtown. There were books I wanted. I wanted these books from that guy who wrote Internet Detectives, in fact I wanted these books precisly, and Pretending to be Normal. I wanted these books because I read them (these are books friends, so I won't say those) when I was ten and I like to read these bullshits to see how computing stuffs are depicted. i could say that of anything, but depiction of computing is a good thing to talk about in society. I could go to the CRA, but it's too much linked to ESPAN. They didn't have Internet Detectives, nor Pretending to be Normal. Gal said they'd write it as forgotten, lost. So I took a psychiatry and clinical psychopathology dictionary, Snow Crash, an analysis book, Siegbert's Schachspiel (Humbert Humbert would be proud.) and Going Straight by Michael Coleman. Snow Crash is great if you want it. The humor, the whole, the society described. What I wore that day. The colors aren't quite right, my hairs aren't like that at all. BMS Gal had a paper fish on her left shoulder. I was trying to capture my dog's interest. 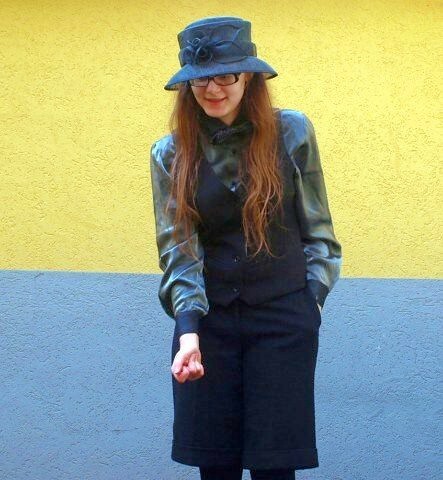 Bermuda shorts and vest from La Redoute, other stuffs thrifted and no idea where they could have originated. Except the hat ; the hat I got at Galeries La Fayette. 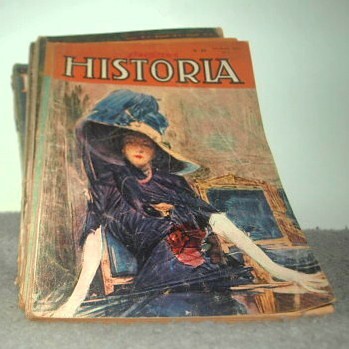 Bunch of old Historia. First one in the stack is from February '55. She gave me these until that dude come. Talks about space flying UFOs, how Napoléon paginated our streets, talks of Alexander Selkirk.